Marvin Lee of Pasadena California Restyled his 1942 Chevy Fleetline AeroSedan when the car was brand new in 1942. 1942, the last year the major US Car Companies brought out a new car model. Production stopped around February that year, and it would not be until after WWII, in 1946 before they would start production again, and introduce new cars. Everything a Hot rod and Custom Car guy would need to turn their every day driver into a hopped up or Restyled driver was rationed, all tools, supplies and most man (and woman) were needed for war production. This however did not stop Marvin Lee, from Pasadena to restyle his brand new 1942 Chevy Fleetline AeroSedan. The 1942 model was most likely produced in late 1941. 1942 Chevy Fleetline AeroSedan from the factory brochure. The car is relatively mildly restyled, with its most obvious modification the filled in rear quarter windows, and the removal of most of the car’s chrome. The end result of the car is one of the best know “ration customs” and despite the early year, we can be very fortunate that several photos of the car have survived. Many thanks to Dean Batchelor and Spencer Murray for taking those photos and hanging on to those all these years. The side profile of Marvin’s Chevy shows the nice lines of the top after filling in the rear quarter windows. And to make it work as good as it does, the drip rails were removed, and the rear top door corner was rounded to follow the shape of the door side window. Marvin Lee’s 1942 Chevy was a typical Custom for the WWII period. Created with the limitations of the time. There was rubber shortage, so there were no white wall tires available, chrome plating parts was not an option either. The real unique details about the Marvin Lee Chevy is that the car was nearly completely de-chromed. With that it was way ahead of its time. 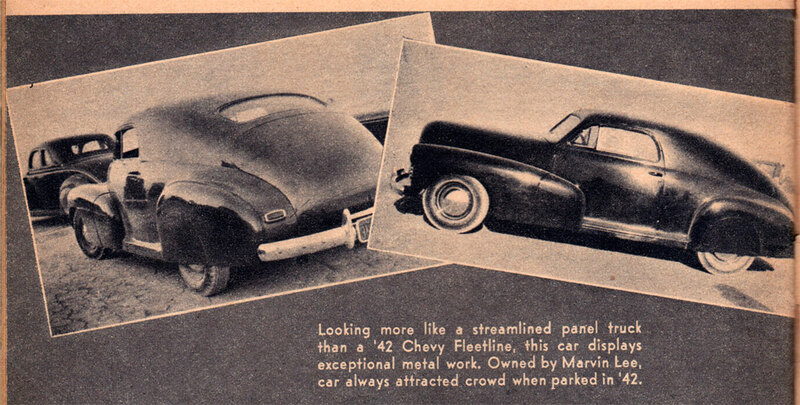 Most Customs from the early 1940’s still had most of their chrome, with perhaps some hood and trunk pieces removed, but on Marvin’s Chevy all the side trim was removed, and even though the door handles remained on the car, they were painted body color to make them less obvious. It does look like the stance of the car was not changed much, perhaps it was lowered a little, but not much. Due to the restrictions the car had black wall tires, possibly the stock units from the factory. And it looks like it was dressed up with some early single bar flipper hubcaps. We do not know if Marvin did all the body work on the car himself, or if a local Pasadena body shop might have done the work. David Giller mentioned Marvin had worked at Coachbuilding shops in the late 1930’s and early 1940’s as mechanic and painter. Filling in the rear quarter windows, removing the drip rails and rounding the door top corners are not easy tasks. Especially if there where no tools, or supplies available as they used to be. We have heard stories that body shops collected and melted down fishing sinkers to use for body work. Perhaps that was what was used on Marvin’s Chevy as well. From this rear 3/4 photo we can see how smooth the body was done. The shaved trunk, removal of most of the chrome and flush factory accessory skirts make it look ultra slippery. The car ran on black wall tires, since there were no white wall tires available, or perhaps it was by choice to make the whole effect even more dramatic. 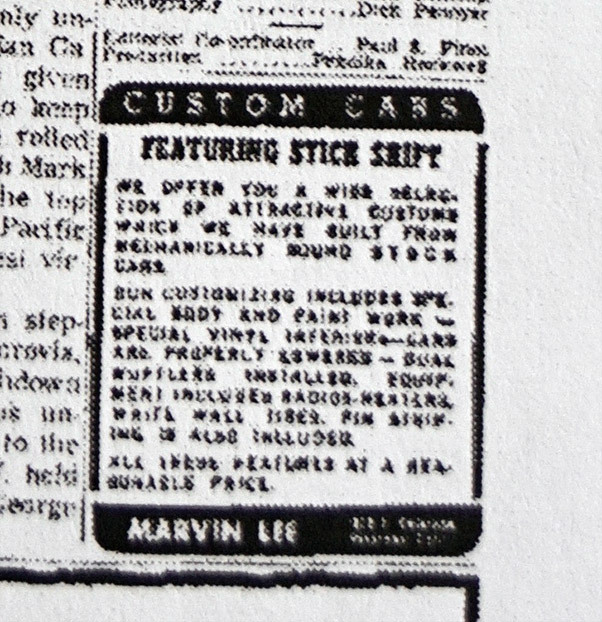 Dean Batchelor wrote a 3 page article in the May 1953 issue of Rod & Custom magazine about Pre-War Customs, and included 2 pictures of Lee Marvin’s Chevy. The only photos we have been able to locate of the car are from around 1942, nobody seems to know what happened to the car after that. Due to the time the car was created, it was never featured in any of the magazine, but the images taken in 1942 were used multiple times in different publications as a sample to show how Custom Cars during WWII looked like. If any of our readers knows anything more about Marvin Lee’s Chevy, has more photos off it, or knows what happened to it after 1942, please send us an email so that we can add it to this article. Marvin Lee was a longtime Hot Rodder and had a background in Customs too. I did some research and found he worked at the famous Bohman & Schwartz Coachbuilders (Pasadena) in 1938 as an Auto Painter, and in 1940 at D’Arcy Coachworks in nearby Alhambra as an auto mechanic. I suspect he could have done the custom work on his Chevy himself. He later also ran fast cars at the Dry Lakes and Bonneville Salt Flats. 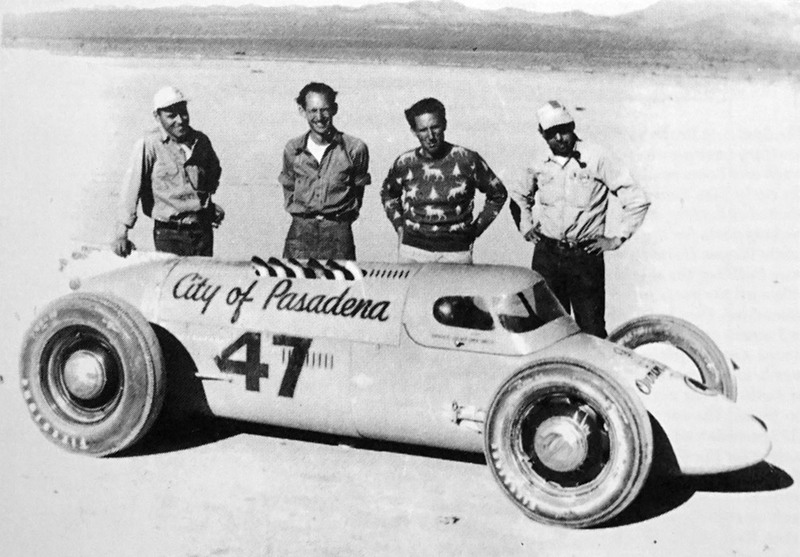 In 1949 at El Mirage dry lake he had the streamliner entry with a Class record at 153.545 mph. Marvin Lee went to Bonneville in 1950 with a new enclosed body streamliner using a Horning GMC six. 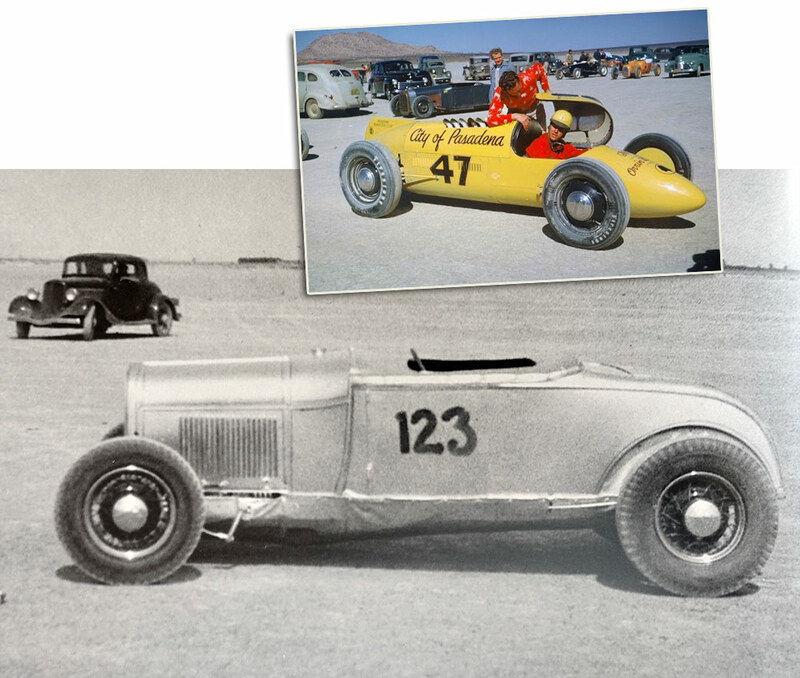 One of the first full body enclosed cars at Bonneville. Also called The City of Pasadena. That car spun and flipped at 230 mph. Only minor injuries to the driver “Puffy” Puffer because the car was so well constructed. Story is that Lee gave up on streamlined cars after that. I didn’t know until recently that Marvin Lee was one of the founders of The National Hot Rod Association (NHRA) along with Wally Parks. Marvin Lee was later involved with new car dealerships in the Pasadena area. Died in Newport Beach in 1994 at 80 years of age. Marvin Lee’s 29 Model A, which burnt complete and a color photo of the City of Pasadena in 1950. Marvin Lee is bending over the car with his red and white sweater. My college roommate, Dave Graham, was from the Pasadena area and in 1956 or 1957 we were over at the Pasadena City College campus on Colorado Boulevard. Adjacent was a Bob’s Big Boy Hamburger restaurant. Dave noted the used car lot next to Bob’s and said it was Marvin Lee’s lot. Lee sold customized cars, all stick shift and well known by the local young car guys. Dave said he was sometimes known by the local car guys as “Starvin Marvin”. This specialty sale lot much the same as the famous Andrews and Evans dealership in Burbank which, oddly enough, was also next door to a Bob’s Big Boy restaurant on San Fernando road. Marvin Lee’s lot was at 1650 E. Colorado, the main street through Pasadena. I have been by there many times over the years. By my experience, these two specialty dealerships usually had a good inventory of clean later model cars, mostly Ford or Chevy, with various levels of customizing – from just a nice set of Glasspak duals, lowering and chrome Moon wheel covers (no flippers) to some cars with additional quality repaint, pin striping, custom tuck and roll interiors, often other special body work and more. 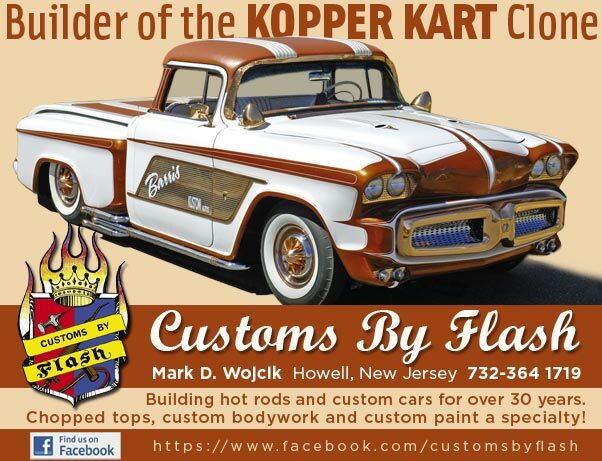 Then there were the occasional full customs by Barris and other shops, maybe earlier show or magazine feature cars plus a couple of finished Hot Rods – Roadsters and Coupes. A real candy store to young guys with some saved first job money to spend. Or just a cool free car show. Dave Graham had a custom 1950 Mercury while we were roommates and he later decided to live at home in San Marino and drive over to school. He then had a very nice slightly custom 1957 Chevy two door coupe. I should ask him if he bought it from Marvin Lee or if Marvin ended up with the Custom Mercury. There were several ads like the one shown in this article in the Pasadena Star News paper from 1956 though 1960. Some advertising about the lot and customizing of the cars for sale and others listing some stick shift cars for sale. My guess is he established the “Custom Car Lot” about 1954 or so. In 1951 he was a salesman at a Pontiac dealer in Pasadena and also in 1949. By 1963 appears he was at other Pasadena new car dealerships like Cadillac, possibly as the owner or a partner. Have not found any car business information for him after about 1966 but he still lived in Pasadena. This is an ad ran by Marvin Lee in the Pasadena Star-News Oct 25 -26 1957. Sorry it is hard to read. 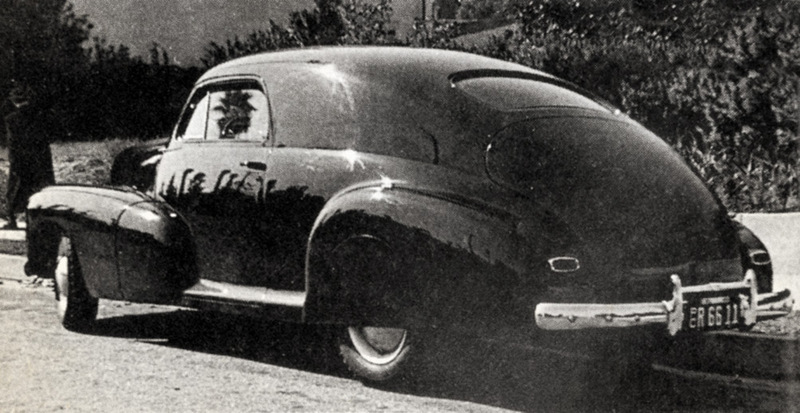 After doing the research on the Marvin Lee ’42 Chevy and Marvin’s personal History David Giller could not help think about the 1937-38 created Phantom Corsair for the Heinz family. And how, in a way, similar this car looked like Marvin’s Chevy. Here are some thoughts about this from David. 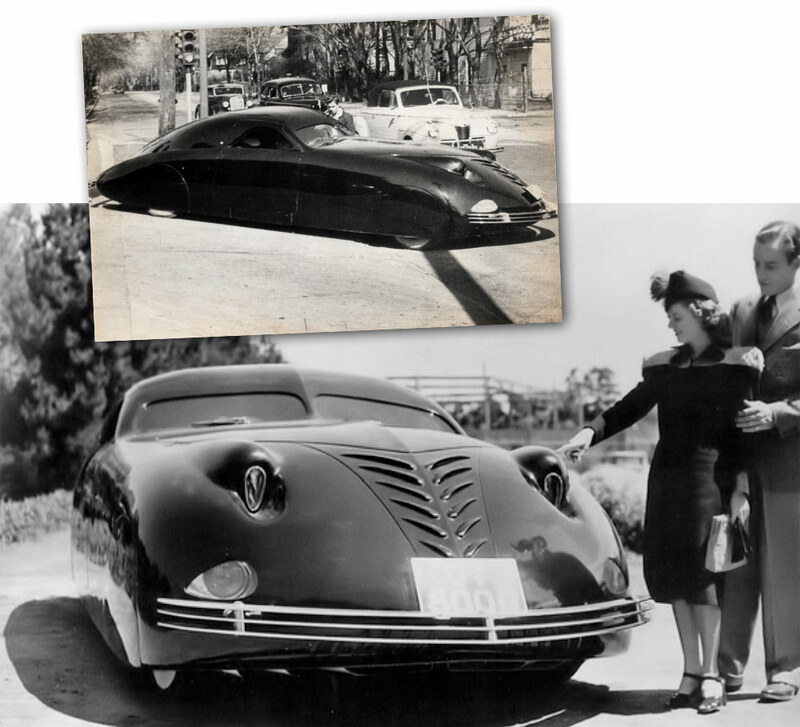 An extraordinary special, one off, custom car of the prewar period was the “Phantom Corsair” designed by owner Rust Heinz of the Heinz Foods family. This on a Cord front drive chassis. I saw this car at Harrah’s museum many years ago and I think also on special display at the Pebble Beach Concours about 1990 or so. Spectacular car and design and unlike anything else up to that time. Lots of photos on this car on the internet or perhaps you have some file photos or even an earlier article on it. When I compare the Marvin Lee Chevy custom details to the Phantom Corsair I see real similarities, especially the closed top line and angle, the fitted skirts, lack of body chrome and impact of the black color. Maybe just wishful coincidence. Except…. The Phantom Corsair was built by Bohman and Schwartz Coachworks in Pasadena in 1937-1938. Marvin Lee was employed at Bohman and Schwartz in 1938, listed as an “Auto Painter” there in the Pasadena City Directory. So very possibly, or likely, he was the original painter and did metal work on the Phantom Corsair. Did it influence his 1942 Chevy Custom? Cool to see one that Isn’t chopped. Plus no spots or speed boat stance. 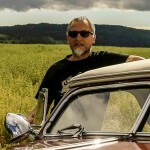 My first car was a 1947 Chevrolet, but it was a 4 door sedan. I always wanted a “Aero” sedan. Man’s creative urge is easily seen in customized vehicles. They’re truly artists. In the late ‘50’s and early 60’s there was a custom painter / pin striper who had a shop on Greene St. in Pasadena named Larry Lee. Wonder if he was related to Marvin Lee. Larry did fantastic scallops, flames, pin striping and monster shirts just like Roth. In the ‘70’s he had a studio in Newport Beach. Did advertising illustrations and some custom paint. Coincidence? Would be interesting to fine out if there was lineage here. To Manuel Reyes- As a young car guy in SoCal in the 1950s, (Hot Rods and mild Customs), I often heard about Marvin Lee, his fast cars at the Dry Lakes and Bonnevile plus knew about his Custom Car sales business in Pasadena. 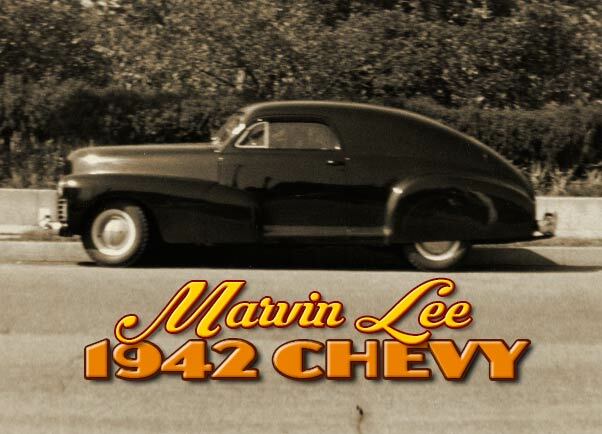 Did a little more research and sent some comments along to Rik Hoving, who kindly added them to his feature articles on Marvin Lee and his custom 1942 Chevy. From research, I knew Marvin and Viola Lee had a son, Larry, born 1939 or 1940 but until your comments didn’t know more about him. Yes, he is or was the same Larry Lee, pin striper, painter and artist you describe. Also a motorcycle racer who reportedly was a Flat Track Champion at the L.A. Ascot one mile track in the early 1960s. Have been around fast cars and a few fast airplanes most of my life but going to the flat track races at Ascot in the late 1950s saw a new kind of speed and courage – almost Warrior class. Also knew about Troy Lee Designs. Troy Lee mostly known, worldwide, for Race Helmet designs but also other race gear and an experienced Bike racer. Troy Lee would be Larry Lee’s son and Marvin Lee’s Grandson. This information from Troy Lee’s website or interviews. Not so much about Custom Cars now but the lineage continues. The information you posted filled in some blanks in my quest to learn more about the history of this great hobby. Larry was as young as I was when I saw him working at his shop in Pasadena. He also was a close friend of paint mixing guru Stan Betz. Stan’s posters and t-shirt art were created by Larry. Seems that Stan once told me that Larry was into motorcycles and traveled up and down the west coast in a nice boat. Larry is very talented. Hope he’s doing well.